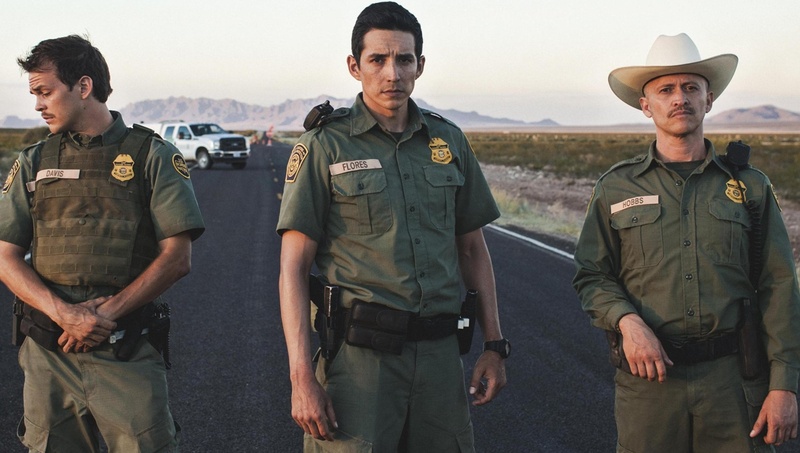 Starring Gabriel Luna, Johnny Simmons, Clifton Collins Jr.
Writer/director Greg Kwedar takes a very specific look at border control along the Arizona border. The focal point of Transpecos centers around three US Border Patrol agents who find themselves in manipulated circumstances. Exploring subject matter that has dominated the presidential race, Transpecos covers so many points of view within these three characters. Kwedar’s script asks important questions, while at the same time delivering a thrilling suspense film that is easily among the best and most effecting work debuting at the 2016 SXSW film festival. Transpecos also contains the three best performances I’ve seen at the festival, especially from Luna (Bernie, Freelheld). What should have been a normal day at work for three border agents Lou (Collins), Lance (Luna) and newbie Benjamin (Simmons), turns deadly when a normal stop traffic stop goes wrong. These agents are posted far from a city or civilization, surrounded by desert and backroads notorious for drug smuggling. Lou Hobbs is the senior agent, a racist hot head who tends to provoke each car they stop. Lance Flores is a mild mannered, by-the-book officer who reminds his team that despite their crimes, the illegals are still human beings. “They are still someone’s child,” he argues with Lou over a child found dead in the desert. Benjamin Davis (Simmons) has only been part of the team for a few months and is still learning to look for suspicious clues during each stop that might lead to a drug bust. Throughout the film writers Kwedar and Clint Bentley explore humanity found and forgotten on both sides of the border. Our eyes feast on beautiful wide shots that aim more at the big sky, than the dusty desert roads. Kwedar introduces us to a part of the US we hear about, but rarely see on film. If Sicario showed us the bigger picture of drug trade and infiltration between the Mexican/American borders, Transpecos shows us the intimate small details. Throughout the film writers Kwedar and Clint Bentley explore humanity found and forgotten on both sides of the border. Yet the film never aims to be political, nor as horrific as Sicario. This is an independent film with a small budget and a large message. The three actor’s ability to sell their characters to the audience is the real goldmine. While the twists and surprises keep you glued to the seat. Transpecos feels like the most important film I have seen at SXSW. It’s a film that could be put in front of anyone, right or left side, American or foreign, and you might have different reaction from everyone involved. It’s the years most agreeable picture. While Collins is still riding his breakout performance in Capote (2005), this isn’t his first time as a border agent (i.e. Babel). Mostly known for bit parts and villains, here he is perfectly cast. Simmons, also forever known as a supporting actor (The Perks of Being a Wall Flower, The Stanford Prison Experiment) also delivers a knockout performance. Yet it’s Austin born actor Luna who steals the show, in an emotional and unforgettable performance. A nail biting, tear jerking, emotional roller coaster of a film that's as important as it is timely.